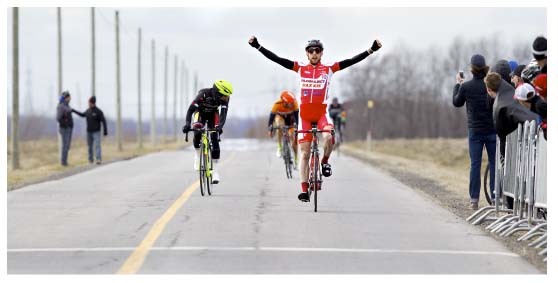 The Velo Select Racing Team, an elite road team based in Quebec, is seeking additional funding to compete on the national stage for the 2016 season. On Thursday, the team launched an Indie Gogo Crowdfunding Campaign to help cover the cost. Club Cycliste Velo Select is turning to its fan base and well-wishers within the Canadian cycling community with the hopes of raising at least $50,000 to compete out of province in 2016. "We're turning to people who love cycling to help get our young incredible racers the opportunities they deserve," said team manager Lyall Beattie. "There's a natural link between the growing number of everyday cyclists and the young racing athletes advancing competitively. Our thought was to create a different environment for supporters and fans of the sport to be able to contribute." "It's a way for ordinary people to be a part of the team," Beattie said. "Of course, we are hoping that the buzz around the campaign will also attract from corporate sponsors in Canada, sponsors who are just waking up the grassroots popularity of cycling." Team Velo Select racing team is going into its ninth year of competition. The team is coached by former Olympian Czeslaw Luakszewicz, a major contributor to Canadian Cycling, who was recently inducted to the Quebec Cycling all of Fame. To join the campaign, go to Sponsorship for Canadian Elite CyclingTeam.